Cherry trees, fruiting plants belonging to the rose family (Rosaceae), naturally occur in Asia and do well in some regions of the United States. Missouri falls within USDA Hardiness zones 4 to 7. If you live in Missouri, select cherry trees according to appropriate hardiness zone, bloom time, flower color and intended use. Various cherry tree varieties typically perform well in Missouri landscapes. The yoshino cherry tree (Prunus x yedoensis) comes from Japan and performs well in USDA zones 5 to 8. This cherry species tolerates various soil and lighting conditions but prefers moist, well-drained soils in full sun. Mature trees range from 30 to 40 feet in height and spread. Yoshinos bear spreading crowns and oval, deep green leaves that turn yellow to bronze in the autumn. Fragrant flower clusters appear in March and April, featuring white petals with subtle pink tints. These blossoms give way to bitter, black fruits that attract birds. Leaf curl and leaf spot sometimes occur. Missouri gardeners often use the yoshino cherry as an ornamental tree along patios, decks and roads. The purple-leaf sand cherry tree (Prunus x cistena) ranges 6 to 10 in height and 5 to 8 feet in width. This cherry variety features red-purple foliage that keeps its color the entire summer. Scented, white to light pink flowers bloom in April, followed by small yields of tiny, purple to black cherries that mature in July. Purple-leaf sand cherries grow best in full sun positions but tolerate partial shade conditions if planted in well-draining soils. This short-lived cherry variety suffers from various diseases and insect infestations. Winter hardy in USDA zones 2 to 8, the purple-leaf sand cherry makes a lovely addition to borders or foundation plantings. The Higan cherry tree (Prunus subhirtella) naturally occurs in Japan and produces unscented, white to light pink blossoms in April. The flowers give way to tiny, black cherries later in the summer. This variety reaches heights up to 30 feet and spreads up to 25 feet. The Higan cherry tree flowers best in full sun locations with fertile, loamy soils. Hardy in USDA zones 4 to 8, this cherry species typically tolerates heat and cold better than other cherry tree varieties. Fireblight and powdery mildew sometimes occur. The Higan cherry works well as a specimen tree in Missouri lawns. The Japanese flowering cherry tree (Prunus serrulata) naturally grows in Japan, Korea and China, and grows well in USDA zones 5 to 8. This cherry tree species generally ranges from 15 to 25 feet in height and spread. Aphids, Japanese beetles and spider mites sometimes feed on the foliage. Japanese flowering cherries prefer fertile, loamy soils that receive full sun. Non-fragrant, white to pink blossoms appear in April, giving way to small, black fruits. 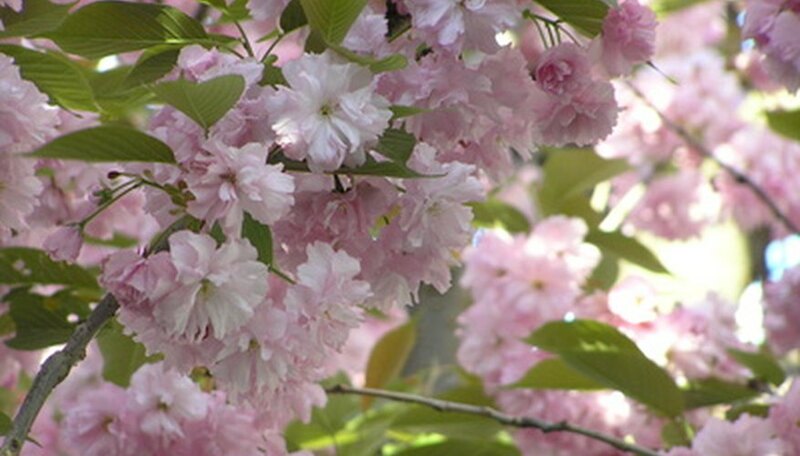 Missouri gardeners often group plant Japanese flowering cherry trees in lawns and parks. Ornamental cherry trees (Prunus serrula), also called birchbark cherry trees, originate in China and reach 20 to 30 feet in height and width. Tiny, white blossoms appear in March and April, followed by small, red fruit that attract birds. The ornamental cherry bears thin, pointed leaves and shiny, red-brown bark that occasionally sloughs off to reveal copper to deep brown inner bark. Winter hardy in USDA zones 5 and 6, this cherry species likes rich, organic soils in partial to full sun locations. Root rot and die-back sometimes occur. Missouri gardeners often use the ornamental cherry as a landscape tree for medium to large lawns.